Delicious Reads: Like Water for Chocolate...Did you know? Like Water for Chocolate...Did you know? The phrase "like water for chocolate" comes from the Spanish 'como agua para chocolate.' This phrase is a common expression in some Spanish-speaking countries and was the inspiration for Laura Esquivel's novel title (the name has a double meaning). In some Latin American countries, such as Mexico, hot chocolate is made not with milk, but with water instead. Chocolate will only melt to create hot chocolate when the water reaches boiling point. The saying 'like water for chocolate' alludes to this fact. It can be used as a metaphor for describing a state of passion or – sometimes – excitement. It may also be used to refer to anger, such as being 'boiling mad'. 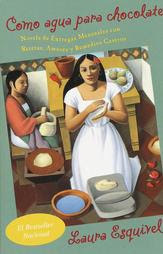 Tita, the main character, actually uses the expression in the book when she says 'estoy como agua para chocolate' (I am like water for chocolate) meaning that she is boiling mad. The Title could also mean that Tita is becoming bitter because chocolate is sweet and water has no taste, so it is literally like water for chocolate. Instead of something sweet she substitutes water for it. very interesting...I am going on amazon NOW and ordering it. I knew there was more on my to-do list! By the way, your quote of the month was one of my favorite passages in Little Women. Also, wow this is my 3rd comment. I just saw that they are doing another Jane Eyre movie that is suppose to come out in 2011. The actress Mia Wasjfskldfjs(don't know how to spell it) is Jane. She also plays Alice in Alice and wonderland. Another Jane Eyre movie?!!! My heart is singing at the thought right now! Good post and this post helped me alot in my college assignement. Gratefulness you on your information.